I am convinced that somehow without my knowledge my children have implanted me with a microchip! (or maybe it was my husband) There is not a place in my house or even outside that my children can not track me down when I don't want to be found! I have hidden on the deck, in the bathroom, in the basement, and even in the shower just to have a little quiet time, but it never lasts longer then a minute! They could be watching the most awesome movie or shoveling forbidden candy into their sweet little mouths without having talked to me or looked my way for half the day and suddenly when I try to sneak out of the room they make it their mission to find me! 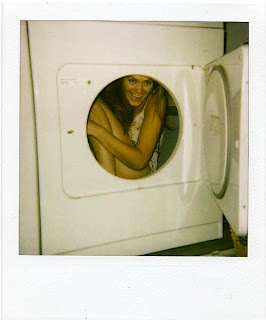 I am willing to bet that I could squeeze myself into the dryer or an air duct and they would still be able to find me! I could be inside the neighbor's bathroom or duct taped to the bottom of a car and they would track me down in 2 minutes flat! However, this only happens when I don't want them to find me. When I want them to find me somehow they become blind, deaf, dizzy, and couldn't find me if I were jumping on their heads! I really don't understand this phenomenon, but it is rather infuriating! Maybe if I pretend that I want them to find me when I really don't I will become like a chameleon and blend right in with my surroundings... I'm not holding my breath on that one!